AHMEDABAD: The Centre's determination for Asiatic lion conservation funds is just 2.57% of what it gives for tiger conservation. Ironically, though tigers are found in many states, Gujarat is the last abode of Asiatic lions in the world. 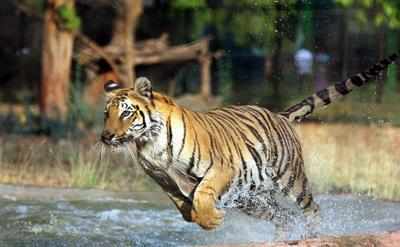 Official sources said that in the year 2016-17 the allocation for funds for project tiger doubled. As against the allocation of Rs 155 crore in 2015-16, the allocation in 2016-17 increased to Rs 342 crore. While tigers have a specific fund allotted in the budget under Project Tiger, the lion is not so lucky, and funds are released only on basis of submitted projects. Even with BJP at the Centre, in the year 2016-17, while the Union government allocated Rs 15 lakh per tiger for conservation efforts, Asiatic lions merited just Rs 95,000 each. A senior officer said that even in the state assembly the government has admitted that for two years — from January 2015 to December 2016 — the central government did not give any additional grants for the Gir lion project in Gujarat. The state government claimed that in this financial year, it had allocated Rs 21.88 crore from its own coffers while in 2015-16 it had allocated Rs 14.29 crore.